New Delhi, July 18 (IANS) Ruling NDA’s candidate M. Venkaiah Naidu and opposition-backed Gopalkrishna Gandhi filed their nominations for election to the Vice President’s post on Tuesday, the last day for filing of papers for the August 5 poll. Scrutiny of the nomination papers will be held on Wednesday. In a show of strength, the top brass of the National Democratic Alliance (NDA) accompanied Naidu when the senior BJP leader and four-time Rajya Sabha member went to file his nomination in Rajya Sabha Secretary General Shamsher K. Sheriff’s room. Those who accompanied Naidu incluced Prime Minister Narendra Modi, Bharatiya Janata Party President Amit Shah, several Cabinet Ministers like Arun Jaitley, Sushma Swaraj, and Prakash Javadekar, besides veteran party leaders L.K. Advani and Murli Manohar Joshi. A number of NDA leaders, including Lok Janshakti Party’s Ram Vilas Paswan, Shiv Sena’s Sanjay Raut and Anandrao Adsul, Shiromani Akali Dal’s Harsimrat Kaur Badal, Republican Party’s Ramdas Athawle, and AIADMK’s V. Maitreyan, were also present. The Telugu Desam Party, Telangana Rashtra Samiti, YSR Congress and the Indian National Lok Dal are among the parties that have extended support to Naidu. Mahatma Gandhi’s grandson Gopalkrishna Gandhi, a former West Bengal Governor and a diplomat, also filed his nomination later. He was accompanied by former Prime Minister Manmohan Singh, Congress President Sonia Gandhi, party Vice President Rahul Gandhi and senior Congress leaders Ghulam Nabi Azad and Mallikarjun Kharge. Besides, Janata Dal United’s Sharad Yadav, Communist Party of India-Marxist leader Sitaram Yechury, Nationalist Congress Party’s Tariq Anwar and Praful Patel, Communist Party of India’s D. Raja, DMK’s Kanimozhi, Trinamool Congress leader Derek O’Brien, Samajwadi Party’s Satish Chandra Mishra, and National Conference’s Farooq Abdullah were among those present wit Gopal Gandhi. Addressing the media after filing his papers, Naidu said he no longer belonged to the Bharatiya Janata Party (BJP) and would strive to “strengthen parliamentary democratic system”. Recalling that the Vice President’s office in the past has been held by great leaders like Sarvepalli Radhakrishnan, Zakir Hussain, Justice M. Hidayatullah, R. Venkataraman, Shankar Dayal Sharma, and Bhairon Singh Shekhawat, Naidu said he was fully aware of the responsibilities and would uphold the “dignity, decorum and traditions” set by his worthy predecessors and work to further strengthen it. 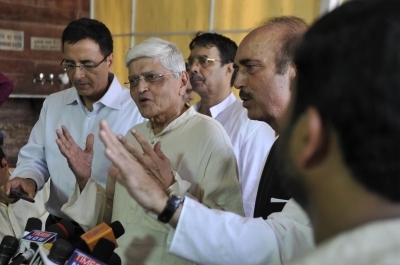 Gopalkrishna Gandhi, after filing his nomination, said he would like to reduce the gap between politics and citizens. In an effective electoral college of 786 members of both houses of Parliament, Naidu is comfortably placed against Gandhi as the NDA has a clear majority in the Lok Sabha. The Lok Sabha currently has 543 members and the Rajya Sabha 243. Both houses have two vacancies each. A senior BJP MP, who did not wish to be named, said that Naidu can easily get at least 530 votes.